PT Indonesia Power - PT IP more popularly called "Indonesia Power" is a leading company in Indonesia, running business in electricity power industry. Indonesia Power has core business competencies on electricity power generation. PT Indonesia Power is a strategic subsidiary company of state-owned electricity giant PT PLN (Persero). At present, PT Indonesia Power is 99.99% owned by PT PLN (Persero) and 0.1% owned employee cooperative in PLN. Indonesia Power is widely known nationwide as one of the largest electricity power generation companies in Indonesia with installed total electricity power capacity of 14,903 MW as at the end of December 2017. Indonesia Power runs its business through 5 Generating Units (GU), 3 Generating and Generating Service Units (GGSU), 13 Generating Service Units (GSU) and 1 Maintenance Service Unit (MSU). According to information found in Indonesia Power's website as cited by JobsCDC.com, PT Indonesia Power supported by 5 directly-owned subsidiaries; PT Artha Daya Coalindo (80% owned by Indonesia Power), PT Cogindo Daya Bersama (99.9%), PT Indo Ridiatama Power (90%), PT Tangkuban Parahu Geothermal Power (95.2%), and PT Putra Indotenaga (99.99%). Indonesia Power also supported by 1 joint venture company (PT Perta Daya Gas, 35%), 2 associate companies (PT Indo Pusaka Berau, 46.53%, and PT Prima Layanan Niaga Sucu Cadang, 49%), and 3 affiliated of subsidiaries (PT Rajamandala Electric Power, GCL Indotenaga, and Indoraya Tenaga). Informatics Engineering, Industrial Engineering, Metallurgical Engineering, Accounting, Management, Administration (Marketing Business, Company, Commerce, Office), Finance Management, Taxation, Communication, Visual Communication Design : GPA ≥ 3.00.Mechanical Engineering, Electrical Engineering, Environmental Engineering, Land : GPA ≥ 2.75. JobsCDC.com now available on android device. Download now on Google Play here. Please be aware of recruitment fraud. The entire stage of this selection process is free of charge. 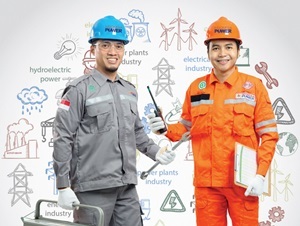 PT Indonesia Power - D3, D4, S1 Fresh Graduate Open Recruitment Program PLN Group February 2019 will never ask for fees or upfront payments for any purposes during the recruitment process such as transportation and accommodation.